If you need to remove an announcement from your course, you can easily delete it in Canvas. To delete multiple announcements at a time, click the checkbox next to the announcements you want to delete  and click the Delete button . To delete an announcement individually, click the title of the announcement. Previous Topic:How do I attach a file to an announcement in a course? Next Topic:How do I add an external RSS feed to an announcement as an instructor? 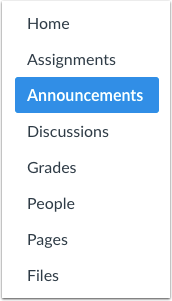 Table of Contents > Announcements > How do I delete an announcement in a course? This is not accurate. There are no places to select multiple announcements and when you select the title of the announcement, the only option the 3 dots give you is to Mark As Read. I'm sorry this is not working for you. However, I double-checked everything in this lesson and it is still up to date with what I'm seeing in Canvas. I recommend reaching out to your institution's support team or to our Canvas Support team (How do I get help with Canvas as an instructor? ) for help troubleshooting why these options aren't appearing for you. There may be an option or setting changed at your institution that doesn't allow certain users to delete announcements. Let us know if you have any other questions. I know it's only been a week since Naomi replied to your comment, but I wanted to follow up with you. Hopefully you were able to contact a Canvas admin at your institution or Canvas Support to address this issue with you. Please let us know if you have any further questions. In the meantime, if we don't hear from you or if you let us know that you've found some answers, we'll go ahead and mark this comment thread for archival. We periodically remove comments from the Canvas guides to keep them updated and tidy. Please don't hesitate to let us know if you have any other questions. We're always happy to help!